Kitchen Remodeling Archives - Resco Group Inc.
is often partly dictated by house style, but not always, especially when one is doing a major kitchen reno and multiple styles are available. If you’re planning on giving your kitchen a makeover, you have no shortage of options when it comes to the style. From rustic to sleek and modern, there is a kitchen design for every taste. Deciding which one is for you depends on your aesthetic preferences and the rest of your home’s interior (you want the kitchen to be seamless, not stick out like a sore thumb). Cabinets and fixtures can change the entire style with added features such as lighting, the style of sinks and faucets further enhancing the overall look of the kitchen. Contemporary- This design borrows high functionality and streamlined surfaces from the modernist design movement, but its style often incorporates traditional ideas as well for a sleek but livable feel. Traditional- Traditional design has its roots in 18th century England and French countryside. The style is known for its warm, inviting interiors that scream comfort. Transitional- Transitional design combines the best of traditional and contemporary styles to create a timeless interior that everyone will love. Together, they form a perfect balance of masculine and feminine resulting in elegant designs. Sleek and minimalist, contemporary kitchens thrive on straight lines, sharp corners and simplistic style. If you have a sophisticated palate, and don’t like ornamentation or old-fashioned fuss, a contemporary kitchen design may just be what you want. Select clean light colors, slab or simple doors or a laminate door and a glossy Quartzite counter-top in the color of your choosing. Stainless steel or black appliances add a crisp look. These kitchens are more classic in style and have many elegant, intricate design features and details. Start with a warm ornamental door style, or, if you prefer easy care laminate kitchen doors. A soft natural stone look in durable acrylic style makes the kitchen not only rich in looks but durable and delightful to maintain. Add a collection of pottery, or some plants for decor. 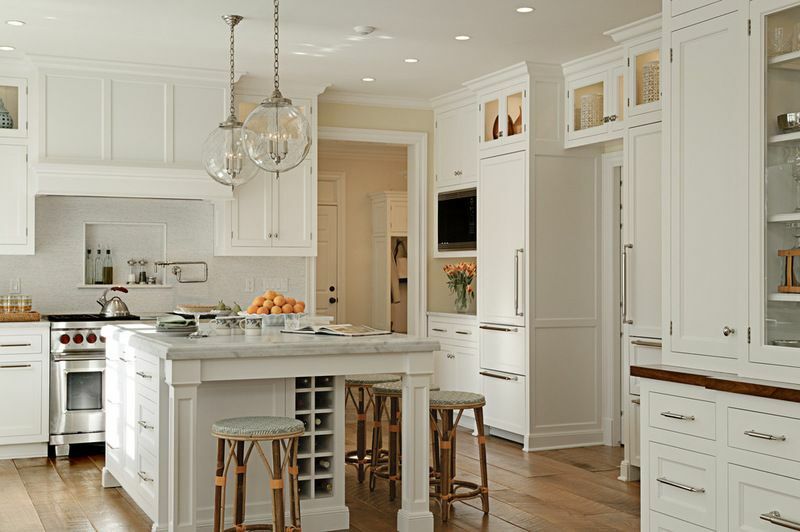 A transitional kitchen blends the traditional and contemporary styles. This style has gained much popularity over the years and can give you the best of both worlds—classic charm and modern flair. Rustic: Rustic style kitchens are a variation of traditional but have woodsy charm. With wrought iron, wood ceiling beams, and butcher block countertops, you can create a rustic space. Country cottage: Another variation of traditional, cozy and charming country cottage style kitchens tend to be bright and airy. Many feature ceramic tiles, colorful curtains or valances, warm tones (pale yellow, sky blue, etc. ), and glass cabinetry for displaying dishes and décor. Shaker style: With rustic charm (wood countertops, simple wood cabinets, and neutral tones), shaker style kitchens have a slight bucolic feel but with the more simplistic style of contemporary kitchens. There are many more options than just these—your imagination is your limit when it comes to your custom kitchen design. You can get as creative as you want! So, you want to remodel your kitchen? Make no mistake, remodeling any kitchen is one of the most expensive endeavors on the extensive list of remodeling costs. With that said, the average price for a kitchen renovation for your area may be higher or lower. The average cost of the project will depend on a range of factors. For example, size, material type (custom, special order, in-stock), and more. With a bit of research, you can strategically plan your kitchen while minimizing costs and what to expect. When estimating what your kitchen remodel will cost, it’s important to understand where your money is going. Understandably, costs for cabinetry and hardware makes up 30% of total kitchen remodeling costs whereas miscellaneous features range between 1-4%. Understanding how your money filters into specific categories is vital should you wish to make any changes along the way. Budget, length of the remodel, geographical location and more will determine the success of bringing your remodeling dreams to life. According to HomeAdvisor, a homeowner should expect to spend an average of $5,000 for a low-cost remodel, $25,000 for a mid-range remodel, to upwards of $45,000 for a major kitchen remodel. However, these numbers are not necessarily accurate to your area. Keep in mind, the costs versus value factor varies widely depending on your geographical location. Furthermore, a homeowner should expect to spend anywhere between 5 to 15 percent of the home’s value for remodeling costs. The idea behind the method is to expect recouping the costs when selling the home post remodel. After gaining insight into national averages of a kitchen remodel, it’s time understand how exactly to prepare. This section is merely a brief overview but you can also view our previous post for a more in-depth guide here: Do’s and Don’ts of Remodeling and Contracts vs Contractors. First and foremost, find a contractor to receive an in-depth glance at all work needed such as electrical, plumbing, etc. You can read more on what to look out for when interviewing a potential contractor in our Contracts vs Contractors: What You Need To Know post. Often, unforeseen circumstances such as mold or other similar concerns can go undetected until after you have hired a contractor. Generally, around ~20% of your estimate remodeling cost should be put in to these unforeseen, potential expenses or “change-orders”. The focus of the cost versus value analysis is the difference between the three kinds of kitchen remodeling in Arizona – Minor Mid-Range, Major Mid-Range, and Major Upscale. The Cost Vs Value report provides us a clue in to whether the value is worth the cost of remodeling. In Arizona, out of 24 projects surveyed the last six years, the recuperation was merely 64.3 cents on the dollar in terms of resale value. While the average costs rose 3%, real estate value is sustained at a 4.2% thanks to real estate economic recovery. Beginning with minor mid-range kitchen remodels, the more recent trend indicates while costs increased by 3.5% over the previous six years, the value of the home declines slightly but by only a mere 0.1%. Comparing the major mid-range to upscale kitchen remodels, mid-range, while higher in costs, retained a significantly higher value percentage. Morrison further states this kind of forecast is expected to increase all the way through 2018; adding if interest rates do not spike and remain favorable, home improvement and remodeling projects should increase throughout 2017 and through 2018.